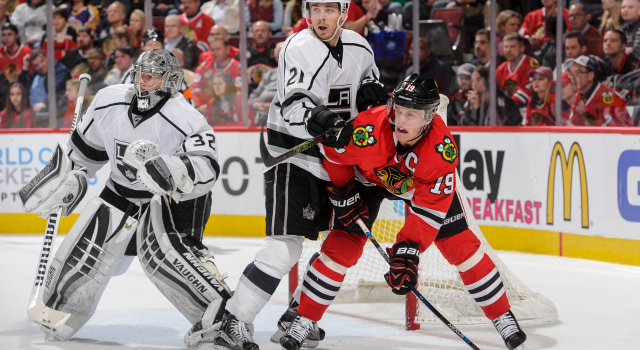 With his name already atop so many team lists, Jonathan Quick established himself as the National Hockey League’s all-time leader of shutouts by a United States-born goaltender with a 32-save performance in a 5-0 win over the Chicago Blackhawks on Monday night at the United Center. With his 41st career clean sheet, he moved past Frank Brimsek and John Vanbiesbrouck for sole possession of the all-time lead after tying the two with a 5-0 shutout in Vancouver on December 28. With a tendency to defer credit to his teammates and value wins higher than personal accolades, Quick noted that he was previously aware of having tied the shutout mark but hadn’t thought of that recently. Brimsek, a Minnesotan who earned the nickname Mr. Zero and who was inducted into the Hockey Hall of Fame in 1966, recorded 40 shutouts between 1938 and 1950 with the Bruins and Black Hawks. Martin Brodeur holds the league’s all-time shutout record with 125. Quick’s shutout was the fourth of his 2015-16 campaign. With 41 shutouts, he is now tied with Marty Turco for the 34th most all-time. With nine postseason shutouts, Quick is tied with Mike Richter for the most by an American goalie. Well, they’re a great team. They’re the best team in the league, them and Washington. We’re familiar with them, they’re familiar with us. We’ve played a lot against each other the past few years. It’s a game you don’t need to do much video or anything like that. You know what you’re going to get. I think we caught a couple bounces, they hit a couple posts. It could’ve gone the other way, so we’re fortunate to get a couple points, and now we’ve got to get ready for Dallas tomorrow night. Yeah, it’s good. Whenever you can get a goal obviously it helps. Especially on the road, it puts pressure on them and makes them play from behind a little bit. We played a great game. He’s a guy that you can play on any line. He’s very versatile and he knows how to win. He’s played in a lot of big games and he’s had success in those games, so he’s a great addition to the team. You’re happy to see him get one, especially against one of his old teams. Yeah, it was nice. I know he’s had that move up his sleeve for quite some time. He’s used it a few times, so it was good to see him dust it off and pull it out. Nobody’s overlooking them. That’s not even a question. No, that’s a group that in high pressure situations, they always seem to be pretty loose and very creative and willing to take chances. It doesn’t really matter the score of the game, they’re always dangerous and could make a play that you didn’t even think could happen.